Although there was awareness of political dissention across the water no one was prepared for newspaper headlines as the 1939/40 season was about to begin. In terms of drama nothing could have trumped England’s declaration of war against Germany on Sept 1, 1939 when they invaded Poland. Ten days later on Sept. 10, 1939, Canada joined the Allied cause against Nazi Germany. In spite of the declaration of war, hockey at home was not immediately affected. The war was well underway before the likes of the Wright brothers, the Bessent twins, Bob Card and Max Henning signed up and left town and the sport as well as the players continued to develop. Five teams competed for the Canadian Utilities Cup in the spring of 1940: the GP Red Devils, Sexsmith-Clairmont Rangers, Beaverlodge Blue bombers, Hythe Maple Leafs, and the Wembly Lions. The fortunes of the Red Devils were somewhat better in 1939/40 compared to their record in the two previous seasons. Although they failed to make the playoffs for the WBHL championship won by a Sexsmith/Clairmont team they defeated Peace River in post-season competition to bring home the Maple leaf Petroleum Cup. In the fall of 1940 the Grande Prairie Herald was completely destroyed by fire. This resulted in an amalgamation of the Grande Prairie Herald and Northern Tribune and was named the Grande Prairie Herald Tribune. The fire may account for some interruption of newspaper coverage during that period as minor and women’s hockey was not well covered but the senior Red Devils were not the only game in town. There was peewee, midget and women’s hockey. 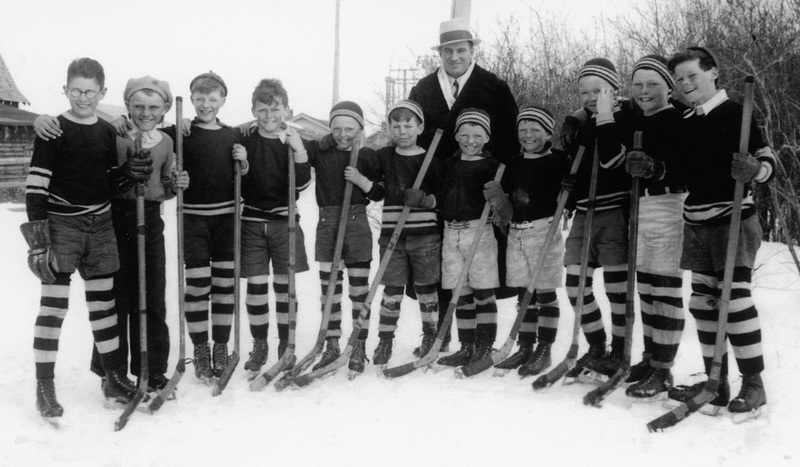 The Tribune reported that two peewee teams sponsored by the Kinsmen and the Elks played between periods at a senior game to the delight of the fans and one old hockey player was heard to remark “Start them while they are young and we will always have hockey players.” The peewees were coached by Johnny Macdonald and were called Johnny’s Peewees. The ever-faithful Bert Bessent coached a midget team and they played against teams from out of town including a team from Five Mile Creek. Bert Bessent’s Grande Prairie Midgets. Back: Bert Bessent – coach Front row: Bill Card, Frank Stojan, Max Henning, Jackie Bromley, Herb Shields, Charlie McAuley, Bob Bessent, Bill Bessent, Unknown, Norman Boyce, Fran Tanner. In the 1940/41 season there is a further account of the women’s team from Grande Prairie once again defeating a women’s team from Sexsmith. In addition to organized hockey the rink provided recreation for others when it was not booked for league games and practices. Fees for skating and hockey were reported as follows “ Evening: adults 25 c, high school students 15 c, Adults can purchase 14 tickets for $2 and high school pupils 14 tickets for $1.50. Season tickets for family: $7.50; adult $4.50, High school pupils $3. 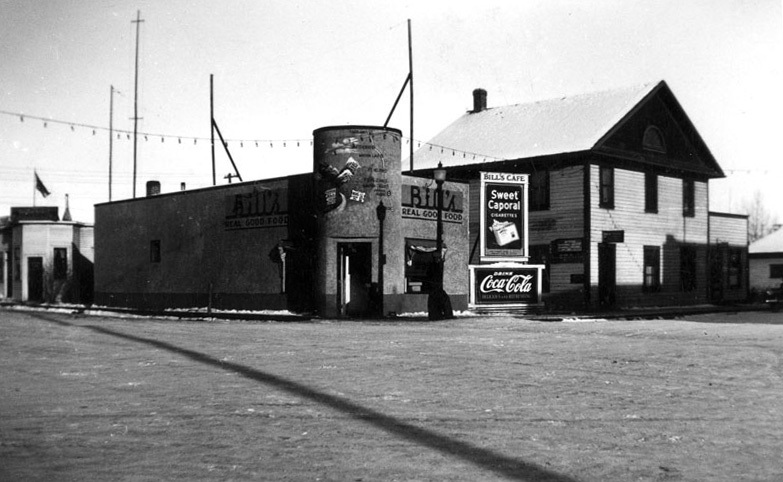 Hockey-adults 25 cents, high school 15 c, and children 10 c. … The Goyne Hotel in Beaver Lodge advertised overnight rates of $1-$1.50 running water and free baths. “All guests of the Goyne Hotel are given free use of the modern baths at no extra charge.” (Tribune). Popular tunes played over CFGP during the war included White Christmas, White Cliffs of Dover, Lilie Marleen and We’ll meet Again. “I Traded My Saddle For a Rifle”, was a tear jerking cowboy-tune that focused on sadness when local boys left home and said goodbyes to sweethearts and horses. “We acquired our first radio that was battery operated in about 1938/39. Reception of CFGP was generally good and on a clear night Dad could tune in Del Rio Texas that regularly played country music featuring the likes of yodeling Wilf Carter and the unrelated Carter Family. Hockey night in Canada was our favourite program. “Keep the Home-Fires Burning” was a patriotic song first published during WW1 and resurrected in WW11. It conjures up images of a real fire – perhaps in a fire place or an airtight heater used to provide warmth before central heating was available. 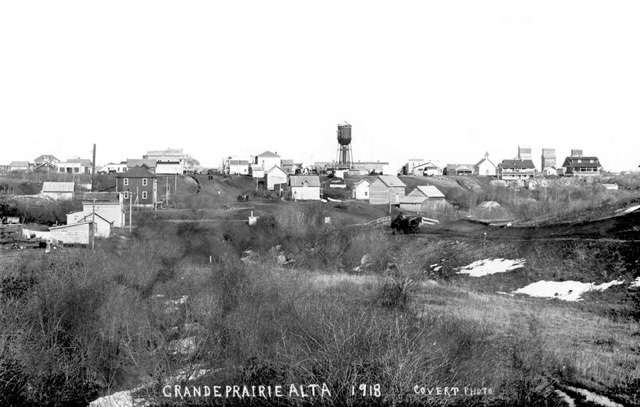 Depending on one’s proximity to Richmond Avenue many homes in Grande Prairie lacked electric, water and telephone service. A gas furnace in the basement can’t match the ambience of a live fire with bright and crackling flames but that ambience came with a price. Woodpiles and coal bins were necessary fixtures at homes on the outskirts of town. Familiar pre-war chores for many Grande Prairie boys who joined up included splitting wood, keeping the woodbin filled and hauling water as these services were not yet available on the town’s outskirts. They were every day tasks that kept people physically fit. With no public transportation and few cars on the street everyone walked. Water service on 107th street at that time consisted of a “waterman” driving a team of sturdy horses pulling a tank of water that was drawn from the water tower near Richmond Avenue. “Residents off the service grid could purchase water by the bucket but it was less expensive to pay a monthly fee (three dollars I think it was) to Mr. Dunfield who owned a well on 103rd Avenue. That explains why there was not a backyard rink behind every house with aspiring hockey players. My brother Bob and I were the watermen at our house. Bob has preserved the cart we used to haul wood and water during the years before water and electric services were available on 107th Avenue. Services were not available on the northern outskirts of the town until the early to mid nineteen forties. The cart now serves as an antique flower container in Bob’s backyard to remind us of those years when someone had to keep the home fires burning and the water barrel filled. When I see the cart it brings back a flood of memories including the frustration I felt when the cart, carrying a fifty gallon drum filled with water became mired in mud - still blocks from home. Or worse - having a wheel slide into a rut tipping the entire load. It never occurred to me then that pulling the cart had a benefit - it was superb conditioning for hockey. Strength training programs for athletes today involve manufactured apparatus to build the same muscles we used to pull the old water cart. To my knowledge there were no gyms in town – not even in the schools. We got our workouts fulfilling daily chores. The waterman also carried several large blocks of ice for ice boxes that pre-dated electric refrigerators. With a saw the waterman would cut blocks of ice to fit into an icebox and with tongs deliver the ice to his customers. On a hot summer day the waterman was a “Pied Piper” with kids following his wagon for an ice chip to slake their thirst. The icehouse was a long low building located in the shadow of the water tower not far from the Wapiti Arena. During the winter crosscut saws used by loggers served to cut large ice blocks from Bear Lake, hauled to the icehouse and packed in saw dust. Stored in this way the ice survived the summer. I clearly recall that for a period of time Hockey Legend Leo Auger owned a water delivery outfit. Keeping fit for hockey was not a problem for Leo. Delivering water and ice was Leo’s fitness program. On the other hand fatigue might have been an issue following a long hard day but Leo never seemed to lack energy on the ice.” (Ron Neufeld). Wartime hockey (1939 – 1945) was a unique chapter in hockey locally and hockey in general. Like the economy it took some unpredictable turns during the war but it persisted unlike hockey during WW1 when the game was put on hold. By the end of the thirties a foundation of young enthusiastic and talented young hockey players was well established in Grande Prairie thanks to leadership from the early volunteers mentioned earlier. As we will see later the town and three military training bases organized the National Defense League (NDL). The NDL replaced the Wheat Belt Hockey League (WBHL) for a short period during and after the war. At its height the NDL involved five - six teams – three from military training bases in town and two teams from Grande Prairie (The Red Devils and D-Company (D-Coy) and Hythe. It called for limited travel, the games were well attended and teams received passionate support from both players and fans. The article, “Dispatches From Juno: Hockey During the Second World War” referenced earlier reports, “Hockey culture is deeply embedded in our Canadian identity. It acts as a community builder and a social connector, with a special ability to cut across social divisions, young and old, urban and rural, French and English, East and West. Playing and watching hockey is part of the experience of living in Canada, and is at the very core of Canadian community and identity. During WW11 when Canadian families faced hardships triggered by the conflict in Europe, hockey culture gained prominence. Hockey continued to be a great social connector, breaking through boundaries and differences whether at home or abroad and for both players and spectators. Hockey news continued to dominate our newspapers throughout the Second World War, acting as a social fabric to bind Canadians closer together.” On the down side “Many young Canadians with promising talents interrupted promising careers to serve overseas. Yet, hockey remained central, and in the dark days of the winter of 1942-1943, when an Allied Victory was far from certain, the NHL announced that the league would continue to operate in the interest of public morale. With the war raging across the globe, the desire to serve their country drew many talented players to hang up their skates and pick up a rifle.” (Juno Dispatches). At home and abroad hockey lived up to the expectations expressed in the Juno Dispatches. Impetus for the NDL that was organized in the 1942/43 season occurred when the Army Training Center in Grande Prairie entered a team to compete in the 1940/41 WBHL season. At the outset of the season it was announced that the league would consist of the Army, GP Red Devils, Sexsmith and Hythe. From the beginning military brass from the newly established Training Centre were eager to become involved with local hockey volunteers and at an organizational meeting early in December Cpl. George Cameron, President and Sgt. John Wallace from the Army were appointed President and Secretary. They served on an executive along with local volunteer L. J. Henning. In a pre-season exhibition game “The Devils had to go all the way to win - good turnout from the barracks to cheer their boys - game quite worth while watching - army turned in excellent showing considering it was their first game.” (Tribune, Dec. 19, 1940). Local hockey hero Charlie Turner JR. who had joined the Army but was on hold for an assignment overseas played with the Army against his hometown hockey buddies. The Bessent twins had not yet signed up and each of them tallied for the Red Devils. Other familiar names on the Red Devil roster were Pete Wright, Gerald Strang, Ernie Nelson and Doug Guittard. There was a harsh reminder for fans at a game on January 1, 1941 of the deadly conflict raging overseas. A minute of silence was observed in memory of a former local hockey hero, goal tender Pee Wee Parrish who died overseas in a plane crash. Another reminder that Canada was involved in the war came on June 19, 1941 when four Wright brothers joined up. For many years the Wright brothers (there were five of them) were pillars for Grande Prairie hockey teams in their respective age brackets. Five brothers would have seen action overseas but the youngest brother Pete was nursing a hockey injury when he became old enough to enlist and the war ended before he recovered from his injury. Pete kept alive the remarkable hockey family tradition at home until his brothers returned. Regretfully only three Wright brothers survived the war - Lieut. M. R. (Kelly) Wright lost his life in active combat in December 1943. Along with senior hockey minor hockey continued to flourish under the leadership of the early volunteers: Bert Bessent, Charlie Turner Sr., L.J. Henning and Johnny Macdonald. There was an active junior league (16 and under) in which the boys from Grande Prairie coached by Charlie Turner defeated Beaverlodge in a close game to win the Oakford cup. 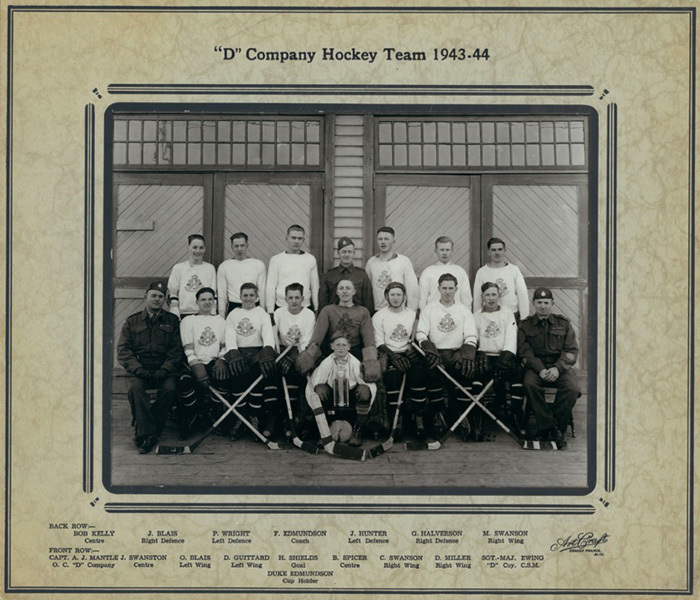 In the May 15th 1941 issue of the Tribune it was reported “The organization of “D” Company 2nd Battalion, Edmonton Regiment, is progressing very rapidly…” The following year it organized a team (D-Coy) to compete in the NDL. In the final game of the 1940/41 season the Sexsmith-Clairmont Rangers once again defeated the Red Devils to win the WBHL championship. There was some redemption for the Red Devils later that same year. Representing hockey South of the Peace they defeated a North Peace All-Star team and brought home the Canadian Utilities trophy. Frank Edmundson and Bob Card were the stars of the game. A proposal was presented to the GPAA on Dec. 18, 1941 for a three team GP League consisting of the Army and two teams from Grande Prairie: D-Coy and the Red Devils. Later with Hythe entering a team it became a four team League. The Red Devils roster in 1941/42 consisted of goalie: Herb Shields; defense: Ken Kirchner and Johnny Ferguson; forwards Bill Bessent, F. Tanner, M. Henning, S. Hrychuck, J. Harrison, R. Tissington, C. Swanson. Sid Ross coached the team while Bert Bessent and Tom Schultz and Charlie Turner Sr. handled management duties. D-Coy included Goalie: Ted Murray: defense: Jack Thorpe, and Charlie Turner; forwards F. Edmundson, Rusty Black, D. Butchart, Bill Lea, Bill Spicer and G. Watson. The newspaper reported that the Red Devils defeated D-Coy 9-7 in the first game of the fall of 1941. However, D-Coy proved to be the powerhouse of the league winning the WHBL championship and the coveted Canadian Utilities Cup. In January 1942, the Red Devils played against the Peace River Auroras for the Maple Leaf Petroleum Cup to recognize the best team in the Peace River country and brought home the cup. “Before a crowd of enthusiastic fans that packed the Peace River rink on Saturday night the All Stars of the South of the Peace vanquished the North Side All Stars for the Maple Leaf Petroleum trophy, emblematic of the championship of the Peace River country in a great battle by a score of 7-4. (Tribune -Thurs, Mar 5, 42). The Bessent twins, Charlie Turner and Gerald Strang were on the ice for the Red Devils. During that game Bobby Bessent broke his collarbone but true to the gritty reputation of the Twins he played for the remainder of the game with a broken wing. The town’s annual Ice Carnival took place in March in conjunction with a fund raising campaign for the war effort. Appearing on the Carnival program were names of two teenagers who would become two of Grande Prairie’s next generation of players and hockey legends. Participating in the carnival skate races was Hockey Legend (Bobby) Bob Neufeld winning in the 12 and under age category and Hockey Legend Pete Wright beating all 16 and under competitors. In 1942/43 the record indicates that another military base in Grande Prairie, the Signal Corps organized a team precipitating the name change from the Wheat Belt Hockey League (WBHL) to the National Defense League (NDL) with four teams: the Army, Signal Corps, D-Coy, and Hythe. Charlie Turner was named Captain of the Army Team and Johnny Macdonald took over management of the newly organized Signal Corps team. The Tribune (Jan, 1943) reports that in an exhibition game the Signal Corps defeated the Army team by a score of 10-8 in a hard fought game. Johnny stated he was pleased with the Signal Corps’ performance as it was the first time the players had been on the ice together. Although the League was not completely formalized, plans were underway to play a game every Saturday night. The D- Coy roster listed Herb Shields – net minder, defense: Frank Edmundson, Hrychuck, Peter Wright, Dale Miller: forwards – Jim Roberts, Rusty Black, Jack Swanson, C Swanston, Ted Meen and Bill Spicer. Hockey Legend Pete Wright, the youngest member of the Wright family was an emerging star and in 1943 at age sixteen he played with D-Coy. 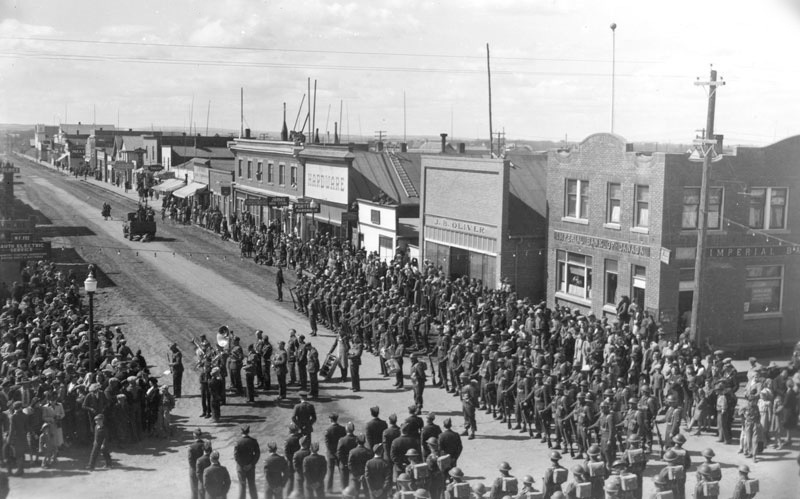 For the next three seasons, until the war ended in 1945 and military bases in Grande Prairie were phased out the NDL provided a valuable emotional outlet for young Canadian soldiers stationed in Grande Prairie and for local hockey players and fans. On “Hockey Night in Grande Prairie” there was never an empty seat in the old Wapiti arena that was nearing the end of its colourful history and at capacity held one thousand spectators. 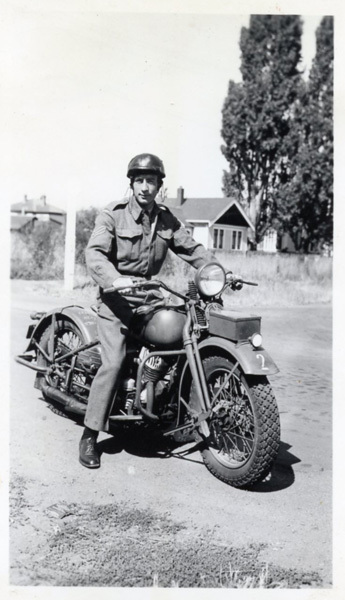 Charlie Turner and his motorcycle. The NDL was arguably the most interesting league of this era. The Eastern hockey establishment had the NHL – Grande Prairie had the NDL. The comparison of the NHL to the NDL may sound presumptuous but the NDL era represents a unique episode in hockey history in Canadian history not just Grande Prairie. It provides a colourful illustration of the manner in which a small Canadian community’s hockey programs adapted to circumstances imposed by the war and provided an important recreational outlet for soldiers away from home preparing for combat overseas. At its height the NDL featured six teams: three teams from military training bases in Grande Prairie, the town’s reserve contingent D-Coy, the Red Devils and Hythe. According to the Tribune, the Red Devils “…will include a number of last year’s juniors, who will graduate to the senior ranks, while the D-Company club will have a lot of older seniors who used to play for the town.” In charge of the Red Devils will be Bert Bessent, Tom Schultz and Charlie Turner Sr. with Sid Ross coaching. For one year there were two teams from town. However, the need for soldiers overseas trumped the need for hockey players at home. Hence, the Red Devils phased out briefly when the local player pool was stretched too thin due to young men such as the Bessents twins and Max Henning’s departure for duty overseas. Younger players too young to sign up who had played with the Red Devils but were deemed ready to skate with the seniors were incorporated into D-Coy, a product of the Second Battalion of the Edmonton Regiment. The rosters of teams from the military bases were also unstable but none-the-less the NDL operated successfully for several exciting years of hockey in town. While the GPNDL was short lived it possessed all the hallmarks of hockey as described in “Dispatches From Juno”. It was a community builder and social connector that cut across age groups and social divides and contributed in important ways to Grande Prairie’s identity as a hockey town. Hockey dominated local news in the paper and on the airwaves. If you weren’t playing the game you were likely following it as a fan, reading about games in the Tribune or listening to local hockey on CFGP. Travelling to distant towns to play hockey was discouraged due to the rationing of gas and tires. The NDL involved limited travelling and each team had a fan base in town. On the ice, in the stands or discussing and debating games in street conversation, hockey provided a diversion from thinking about the atrocities of war and periods of relief for servicemen who longed for the comforts of home. The war stopped when the puck dropped. D-Coy players Max Swanson, Bill Spicer and Doug Guittard proudly display their NDL Championship trophy. The 1943/44-hockey season started on a dismal note with news from overseas that four of its native sons (Lieut. M.R. ( Kelly) Wright, Sgt. :Gunner Bob Bessent: Sgt. Gunner Gerald Strang: and Gunner H. Saunders had been killed in the line of duty overseas. On the home front, in addition to managing the Signal Corps hockey team, Johnny Macdonald took over management of the rink. Although it was a mild winter and maintaining good ice was a challenge the league proceeded as planned. At fifteen Bob Kelly replaced Pete Wright as the youngest D-Coy player. Bob went on to a sparkling career playing hockey in Europe after the war along with Hockey Legends Ken Head and Pete Wright. Bob was a hero to one Renato Pedrini from Italy who has conducted several golf tournaments in Europe and Canada in honour of the contribution made by Canadian hockey players to the development of hockey in Europe following the war. It was no small contribution and will be described later in this series. Pedrini reports that Bob Kelly was the finest stick handler ever seen in Europe during his era. One might think that teams in the NDL, especially members of the different military units, Army, Signal Corps and Air force would be mild mannered friendly tilts. However passions ran high and lack of sound judgment was undoubtedly fuelled by bottles of hooch that were smuggled into the arena under bulky military issue great coats. During the third period of a game on March 16, 1944 between the Signal Corps and the Army a bench-clearing brawl broke out. Jack Crummy was the referee and military police were present at the game. However, they were no match for the outbreak of what the Tribune described as an “all out brawl”. A virtual war on the ice between two allied contingents was averted with the playing of the National Anthem. Overseas Canadian soldiers were noted for the disregard they had for meaningless administrative and political protocol. However, to a man the combatants respected the National Anthem and came to attention when the familiar strains were played over the public address system. A week later during the final game of the season between the Signal Corps and D-Company seventeen year old D-Coy’s Pete Wright dropped the gloves with Bob Vandall of the Signal Corps and once again total mayhem was prevented by “… a few strong arms and playing of the National Anthem.” D- Coy went on to win the game and the NDL Championship without losing a single game that season. Back row from left - Bob Kelly, centre, J. Blais, right defence, Pete Wright, left defence, Frank Edmundson, coach, J Hunter, left defence, G.Halverson, right defence and M. Swanson, right wing. Front row from left-Captain A.J. Mantle, O.C.”D” Company, J. Swanson, centre, Oscar Blais, left wing, D. Guittard, left wing, H. Shields, goal, B. Spicer, centre, C. Swanson, right wing, D. Miller, right wing, Sgt-Maj. Ewing “D” Coy. C.M.S. Centre front-Duke Edmundson, cup holder. The above are the only two incidents that the newspaper reported in which the National Anthem was played to bring a fracas on the ice to an end. There were other similar incidents that went unreported. “I was at one game involving the Army and the Signal Corps that erupted into not only a bench clearing brawl but a clearing of all military men from the stands. Picture this – a fight breaks out on the ice - both benches jump to the ice. Almost immediately fans from both the Army and the Signal Corps pour over the boards like a tidal wave. Many were unsteady on their feet due to too much alcohol. Add to that army footwear on the ice that would have seemed like buttered boots on an oily surface and the entire ice surface was a swirling mass of great coats, some struggling to maintain an upright posture and throw a punch, others squirming like beetles to gain an upright position after loosing their footing. Once again it was the National Anthem to the rescue but on this occasion it took two renditions of the Anthem and after that the dousing of all lights to get emotions under control. During the first rendition of the Anthem combatants stood at attention while glaring at their opponents and as soon as the first playing of the Anthem ended the fights resumed where they had left off. Tempers settled following a second playing of the anthem and a “lights out”. How serious injuries failed to occur is a mystery to me. Part of the reason is likely that army boots on the ice prevented the traction needed by combatants to deliver a meaningful blow. As well, bulky great coats undoubtedly cushioned their falls - talk about passion. It is not at all impossible that combatants on the ice at some later date overseas may have fought shoulder to shoulder against the Germans overseas.” (Ron Neufeld). “Following the game, the teams lined up and Frank Edmundson, D-Coy’s coach, was presented with the beautiful trophy presented by L. J. Henning, President of the Grande Prairie Athletic Association, donors of the trophy.” (The Tribune). 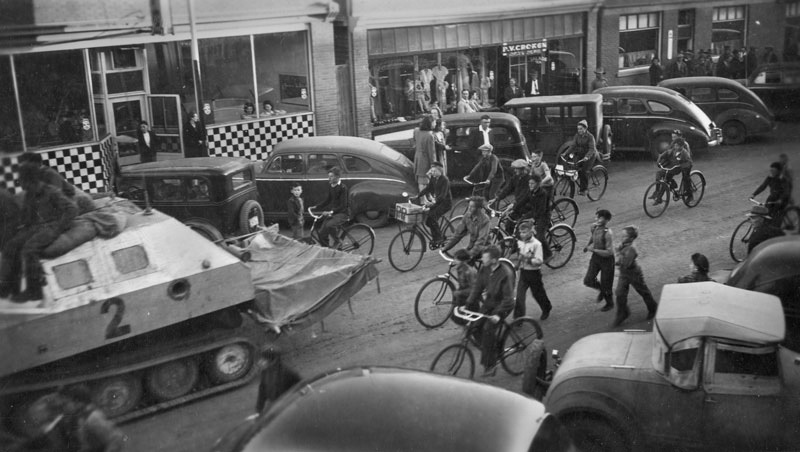 Musk-ox Expedition on Richmond Avenue, 1945. Grande Prairie was one of the towns on the route of the Muskox Expedition, the Canadian and American military joint exercise to practice defense tactics in a northern environment. The zenith of the NDL came in 1944/45 when the RCAF Flyers stationed at the airport entered a team. The League consisted of five teams, the Army, Signal Corps, Air Force, D-Coy and Hythe. Where the Air Force had been hiding is a mystery, as they immediately became the NDL team to beat. Some local critics alleged that the local military brass at the airport pulled strings to have talented players moved to Grande Prairie to pad their team. “I recall being mesmerized by one especially talented young player on the Flyers. There is no record of individual players from the military who played in the NDL but according to my recollection he was from Saskatchewan. I swear – he could stick handle into a hive of wasps and emerge from the hive without a stinger. “ They won the NDL championship for the last two years the NDL existed: 1944/45 and 1945/46. The D-Coy roster included - Norman Chugg – goalie: Def: Pete and Cliff Wright, G Halverson and D Banting: forwards: D. Guittard, W. Spicer, M Swanson, E Blais, B Kelly and Bob Hunter. “On January 25, the RCAF narrowly defeats the Signal Corps by a score of 7 – 6. Johnny’s Peewees entertain the fans between periods.” (Tribune). Unfortunately late in the 1944/45 season the Signal Corps had to withdraw from the League as their training base was being phased out. The good news of course was that the war in Europe ended May 8, 1945 and shortly thereafter the boys began returning home. Billy Bessent who was awarded the Distinguished Flying Medal returned home in November, 1944 and Max Henning in February, 1945. Both of them immediately became involved in hockey with Max introducing another interesting chapter in Grande Prairie hockey by organizing the Key Club and helping to develop young hockey talent in Grande Prairie. It was the introduction of what many consider to be the Golden Years of Grande Prairie hockey. Over the years both men have made significant contributions to hockey and continue to provide invaluable information concerning hockey during their era. Gas and tire rationing were still in effect but according to Max Henning that did not prevent an eighteen and under team from travelling to Fairview for a game early in February 1945. Max resorted to a travel mode that was familiar to him prior to the war. “Fifteen hockey players 18 years and under from Grande Prairie journeyed to Fairview, a distance of 115 kms. in a horse drawn sleigh, after shoveling much snow. In the evening they tangled with a hockey team from Fairview and were defeated 6-4. However, they rebounded the following day defeating the same team 6-5. On the following day they proceeded to McLennan and won from McLennan 9-8 after being down 8-3.” (Tribune). As for the time it took to make the trip - do the math – the horses likely moved at about four miles per hour. Such was the need and desire of young people, regardless of obstacles to play and of volunteers like Max to support that desire. On February 22, 1945 the RCAF Flyers defeated D-Coy by a score of 9 – 2 to win the NDL league championship. Max Henning had just returned home and suited up for D-Coy in that game. Guests of honour at a season ending wrap up banquet included Lieut. Alan Wright (M. M., D.S. C.) F/O Roy Wright, F/O Max Henning, a former Red Devil hockey player; F/O R.K. Card, (D.F.C. ), also of the Red Devils: J. Ross, coach of the Signals hockey team, and Jack Crummy. Frank Edmundson, coach and manager of the hockey team was master of ceremonies.” (Tribune). At the banquet it was recognized that the Wapiti Arena, having served the community for 27 years needed to be replaced and the process was set in motion for building a new hockey facility that would be dedicated to the memory of men and women who had served and given their lives for their country during WW11. In broad perspective the period covered by this episode (1918 – 1946) has a bi-polar profile. There was a euphoric period – the Roaring Twenties followed by a serious emotional downer, the Great Depression and finally a very focused episode – WW11. Hockey was therapy that carved a reasonably steady path through each stage providing respite for both players and fans from the stresses and strains of depression and war. This episode began with the completion of the first covered arena in the north, the Wapiti Arena and we can only wish that its walls had eyes, ears and a tongue to share tales from its twenty seven year history: tales that would be stranger and more exciting than fiction. A number of attempts were made during the early phase of this episode to organize a successful hockey league and in 1938 that came to fruition with the advent of the WBHL. The episode concluded with one of the most captivating stories of a hockey league, the NDL that offered relief from the cruel realities of war. During the twenty-seven year period of Episode Two the first group of Legends was born. They set the stage for what is often regarded as the Golden Years of Grande Prairie hockey and some of the most remarkable examples volunteerism. Bert Bessent, Leonard Henning, Charlie Turner Sr., Frank Edmundson and Johnny Macdonald were chief among the early volunteer pioneers and their stories appear throughout this episode. They served as role models for the army of volunteers and players that followed in their footsteps bringing about the Golden Years of hockey in Grande Prairie. Their stories are told in the Legends Builder category of the web site. In retrospect it is clear that Germany failed to exercise due diligence by initiating a war against the likes of the Bessent twins, the Wright brothers, Max Henning, Charlie Turner, Fran Tanner, Pee Wee Parish, Gerald Strang, Bob Card, Baby Face Nelson, Sandy Saunders, Bob Hunter and Doug Guittard. They brought to the international conflict in Europe the toughness, the will to win “never give up mettle” and the team spirit they acquired in a new country and demonstrated on the ice. At the beginning of WW1 Canada was widely viewed as a British colony and England assumed that Canadians joining the war effort in Europe would be integrated into the British Army. That assumption on the part of the British military brass was firmly rejected by the Canadians who insisted on keeping their own identity overseas. On the battlefield when compared to British and French soldiers Canadians showed a healthy skepticism for bureaucratic protocol and the hobbles of tradition. The independent spirit of Canadian soldiers was regarded by many as lack of discipline. The Battle of Vimy Ridge in April of 1916 illustrated that the Canadians had a different kind of discipline that allowed for creativity. Vimy Ridge was a strategic location in France held by the Germans and attempts to take it by both the British and French armies were repulsed by the Germans in WW1. Careful planning, ingenious military strategy, mental and physical toughness and open communication between military brass and foot soldiers that broke with military tradition in France and Britain were factors in the battle for Vimy Ridge. Far from being undisciplined the Canadians demonstrated a “creative discipline” that routed the Germans. It was the kind of discipline that respects the judgment of individuals – the kind that hockey players demonstrate on the ice while playing as team members but encourages creativity and the freedom to take advantage of unpredictable opportunities. The defeat of Germans by the Canadians at Vimy Ridge is regarded as a defining event in shaping the identity of Canada on the world stage. The same creativity and determination the Canadians demonstrated at Vimy ridge continued in WW11. If the English and French traditionalists were not always able to appreciate the “Canadian Way” the Germans did. 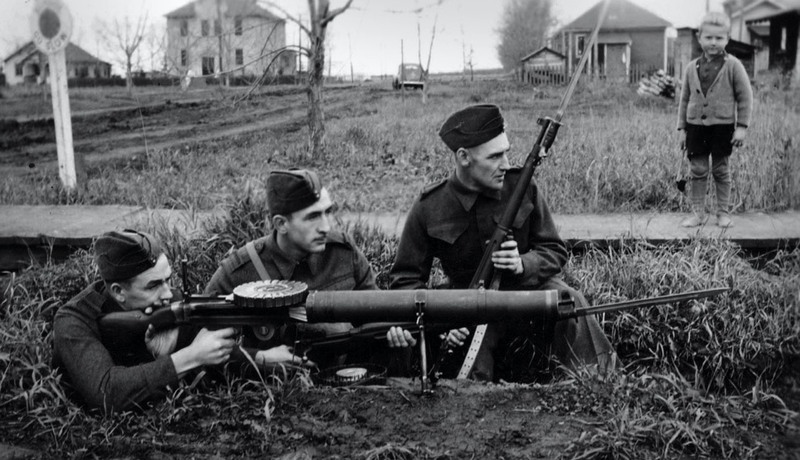 They had developed a healthy respect for the tough Canadians on the battlefield and dreaded confrontations with them. It is not the intent here to overstate the role of hockey in building individual and national character but behaviours related to creativity, cooperation with others, team play, and leadership skills are important aspects of the game. 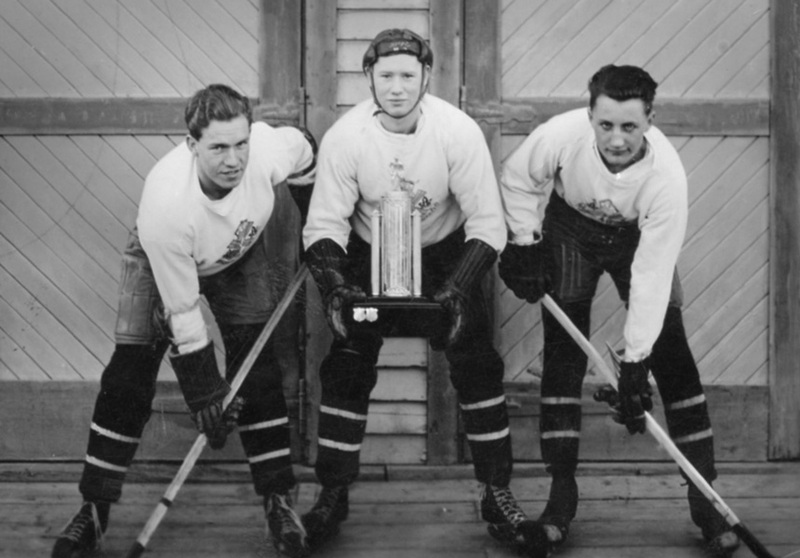 The important role that hockey played abroad and at home was reinforced by “the Juno Dispatches” following the war. Hockey has become one of many Canadian traditions that shape our identity. Ask foreigners to describe Canada and hockey is one of the descriptors one is likely to hear. Since the war, hockey players from Grande Prairie that were too young to join the war effort from Grande Prairie have continued to make their mark at home and abroad. Their stories can be found in the “Hall Of Fame” on the web site and will be featured in later episodes of this series and the induction of up-coming legends that meet criteria established by the Legends Committee. The end of Episode Two coincides with the dismantling of the Wapiti Arena while Episode Three will begin with the building of the Memorial Arena dedicated to honour the men and women who served and lost their lives for their country. Newspaper articles in 1945/46 are replete with information conveying both nostalgia and excitement as the Wapiti Arena became history and the Memorial Arena introduced a new era that included the Golden Years. Frank Edmundson was Master of Ceremonies at a season ending banquet in 1945 when he promoted the need for a new arena. He commented that “it was a real hardship to have to sit in the old arena and watch a game through in cold weather.” Bert Bessent addressed the audience at the same meeting. He commented that he had been a member of the GPAA for the past 20 years and hoped that by the time the next winter rolled around the town would have the finest rink in the country and that members of the hockey team would remain in town. Undoubtedly it was his hope that he could retire and be assured that there were capable volunteers to replace him and other old timers on the stage when they stepped down. He was not to be disappointed. While Bert and other volunteers with whom he had worked over the years did not step out of the picture completely in 1945 an eager and capable army of volunteers was preparing to step into their shoes. The so-called Golden Years of Grande Prairie tells a most compelling story of volunteerism at its best and some remarkable results.